"We can now harness the sun, that is the coolest thing ever." A company focused on a sustainable future. Our planet is all we have. How we treat it will reflect how it treats us. Global warming, climate change, erratic weather patterns all could be the result of our misuse of the environment. Current technology shows us a better way to handle the balance between economy and ecology. Acting on these technologies is the only way to avoid potential future environmental disasters. We consider ourselves environmental stewards, but back that precious title with our actions. William C. Huff Companies regularly trade out our vehicles for later model, low emission vehicles. In fact, our latest models produce less than half of what other vehicles emit. The production of electricity in the US annually produces over 1900 million tons (that is actually, 3.8 trillion pounds, by the way) of co2 pollution! Electricity is the single largest source of carbon dioxide emissions of all energy related pollution. Photovoltaic electricity, solar panels, is a efficient and cost effective way to produce electricity with zero pollution. At William C. Huff we have one entire 44,000 sq ft storage warehouse climate controlled by solar electricity. In our first full year with solar we had a negative carbon footprint in that produced more power than we used and we prevented over 200 tons of co2 from going into the atmosphere. We are committed to bringing solar to our other facilities and, are encouraging all our staff who have homes to consider going solar for their own electricity. The William C. Huff Companies’ policy of “free pick-up of used boxes” helps to reuse over 250,000 lbs of boxes every year. Also, we reuse 100% of all wooden crates that are built for transporting art and sculptures. 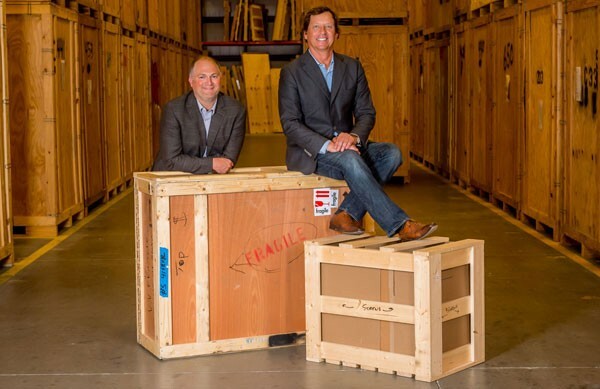 New furniture and household goods that come into the William C. Huff warehouses are packaged in cardboard or are in wooden crates. Over 350,000 pounds of cardboard is recycled each year and most of the wooden crates and pallets are reused.